I am thrilled to finally own my very own bottle of Mr. Bubbles! 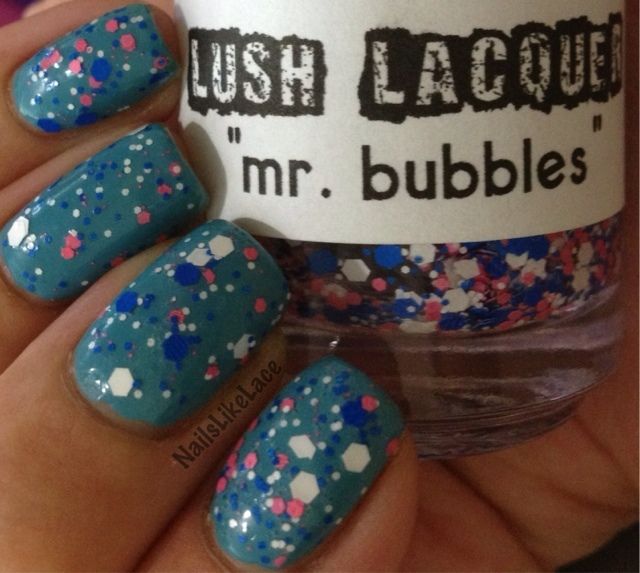 I always love this Lush Lacquer more and more every time I see it on other blogs! Even though it took a lot of fishing and two coats for what you see here, this one is a beauty! I layered it over an L.A. Girl matte polish that I have somehow lost the name to, and I love the combo! Placement was fairly easy with this one, the glitters stayed where I put them, for the most part. I had a few issues with the bigger-sized glitters peeling off since I didn't use a topcoat, but I really like this mix of colors, and I love the matte blue bits in it!